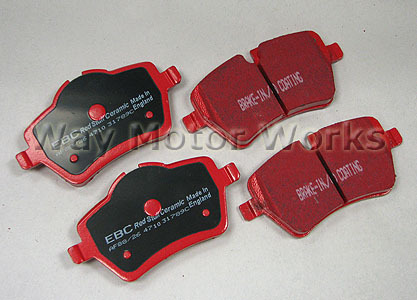 EBC Redstuff Brake pads for R60 Countryman S and R61 Paceman S.
Redstuff formula for cars above 200bhp and fastest street driving For FAST STREET USE or daily driving. This material is a Kevlar fibre based brake compound enhanced with ceramic particles. If you have previously tried EBC redstuff (pre-ceramic compound) this material is light years ahead. It lasts longer, it brakes better and is quieter. Being a hard wearing pad, bed-in times can be as long as 1000 miles and drivers must be patient until the pad takes up the shape of their disc (brake rotor). This is a great fast road pad for repeated heavy braking. It emits far less dust than semi-metallic pads and has been proven to stop a passenger car/sedan/sport compact/hot hatch quicker than OEM pads from 100mph/160kph. Features EBC Brake-In surface coating which conditions rotor surface and accelerates pad bed-in. Nominal friction coefficient 0.5 with approx. 50% dust reduction compared to other pads. Sold per axle set front or rear.